Putsborough Sand is a large sandy beach in North Devon. 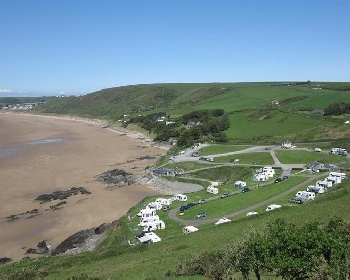 The beach stretches north for 2 miles to Woolacombe. Parking and facilities are close to the beach. Update March 2015 - We have a report of palm oil being washed up on Woolacombe Beach. This is poisonous to dogs. Please exercise caution when walking dogs on Woolacombe Beach and beaches in North Devon. No lifeguards. Signs warn of rip currents, not to bathe near the rocks and not to use inflatables in an offshore wind. See Beach Safety Guide. From the car park there is a road down to the beach shop/café and from there a concrete slope to the beach. Dogs are banned on the beach below the beach shop from 1st April to 31st October (some signs say Easter to 31st October). On the beach north of the shop, dogs are allowed all year. Putsborough Sand is about 9 miles from Barnstaple in North Devon. There are various routes to Barnstaple from North Cornwall or Devon. At Barnstaple take the A361 over the new road bridge over the River Taw and then at the Braunton Road Junction turn left for Ilfracombe. Follow the A361 to Braunton. On the A361 there are various routes to Putsborough. The most direct route is to drive through Braunton and on the outskirts of Braunton after the Fire Station turn left (signposted to Georgeham) and follow this road through the hamlet of Darracott to Georgeham. At Georgeham, drive to the junction opposite the shops, then turn left. Then take the next right (signposted to Putsborough) and then take the next left (again signposted to Putsborough). Follow this road out of Georgeham to the hamlet of Putsborough. Drive through Putsborough and follow this road for about a mile to the Putsborough Sand car park. 1 large car park above the beach. Yes, in the car park.